New Delhi: India faces the serious challenge of finding jobs for a growing population over the next 35 years; its economy could absorb less than half the new entrants into the labour market between 1991 and 2013, the latest Asia-Pacific Human Development Report said. The report, released by the United Nations Development Programme (UNDP) on Wednesday, said that between 1991 and 2013, the size of the “working age" population increased by 300 million. Of this, the Indian economy could employ only 140 million, suggesting a limited capacity to generate jobs. The report estimated that by 2050, at least 280 million more people will enter the job market in India. According to labour ministry data, around 1 million people enter the workforce in India every month. Many others simply choose to study more. At any given point, around 30 million students are pursuing higher education in India. UNDP said countries such as India, with large low-income populations, big agriculture sectors and high rural-to-urban migration, could focus on specific industries, particularly in manufacturing, to create jobs. “This switch has been key to high job growth in China, leading to a significant decline in poverty. In India, in contrast, the manufacturing base is still small, contributing to only 15% of GDP and 11% of employment," the report said. Indeed, this is one of the driving forces behind the government’s ‘Make in India’ campaign aimed at attracting foreign investment in manufacturing. India could reap a demographic dividend if it succeeds, the report said. It added that an analysis of India’s rapid growth since the 1980s shows that a substantial share came from changes in the country’s age structure, and predicted this could continue adding about 2 percentage points per year to per capita GDP growth over the next two decades. “Globally, current estimates project that for every 1 percentage point increase in the working-age population, real per capita GDP growth rises between 0 and 1.1 percentage points, depending on the region," the report said. N.R. Bhanumurthy, professor of economics at the National Institute of Public Finance and Policy, said the creation of fewer jobs between 1991 and 2013 was largely because of the nature of growth the Indian economy experienced. “It was mostly services-led growth with low employment intensity," he said. “The new government seems to have realised the issue. The problem could be addressed if the government’s effort to create more manufacturing jobs through programmes such as Make In India and Startup India fructifies," he added. According to the report, China and India accounted for 62% of the workers in the Asia-Pacific region in 2015, with 1 billion and 860 million workers, respectively. “But China’s share of working-age people is now falling, while India’s continues to rise, and is expected to touch a maximum of about 1.1 billion in 2050. To a large extent, China and India, now home to 2.6 billion people, will drive demographic changes in the region and influence their consequences. India’s population will likely surpass China’s by 2022, possibly earlier," the report said. 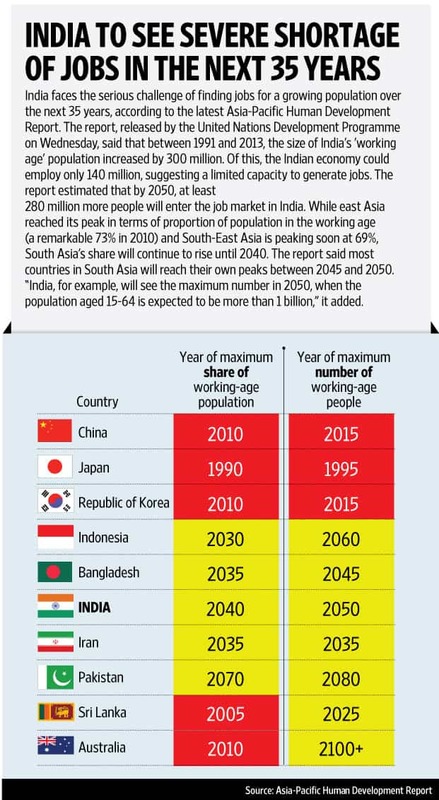 While east Asia reached its peak in terms of proportion of population in the working age (a remarkable 73% in 2010) and South-East Asia is peaking shortly at 69%, South Asia’s share will continue to rise until 2040. “At present, the median ages in East Asia, South-East Asia and South Asia are 38, 29 and 26, respectively, a disparity prompting growing migration within the region," UNDP said. The report said most countries in South Asia will reach their own peaks between 2045 and 2050. “India, for example, will see the maximum number in 2050, when the population aged 15-64 is expected to be more than 1 billion," it added. India’s challenge of providing remunerative employment is also more complex because of its large informal sector; this accounts for 84% of current jobs. The report said that while a vibrant informal economy keeps a large number of low-wage workers employed, such employment leads to many problems, including inadequate protection for workers. In India, for example, 1 in every 10 workers is employed in the construction sector (a total of 50 million people in 2012). “Measures to begin correcting some of these concerns include universal registration of workers; effective implementation of existing labour laws; formal binding guidelines for contracts between employers, recruiters and workers; reform and harmonization of major labour laws applicable to the industry; and reform of social security laws to allow more effective implementation," the report said. UNDP said that in India, Indonesia, the Philippines and Vietnam, rising wage inequalities are closely linked to widening wage gaps between people with higher education and those at lower levels of schooling. “Without intervention, today’s inequalities in education will become tomorrow’s inequalities in the distribution of wealth and wider opportunities for human development," the report warned.